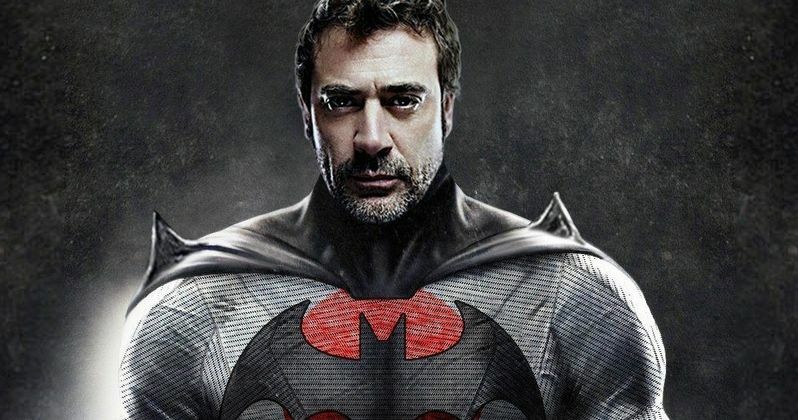 Is there really a possibility that Jeffrey Dean Morgan could play Batman in the upcoming Flashpoint movie? He's certainly not willing to rule it out. Shortly after the movie was announced, fans began to hope this could be the case, and Morgan even threw a little fuel on the fire himself. But he hasn't really been asked about it since the announcement was made. Jimmy Kimmel finally confronted him. And his response was pretty telling. Jeffrey Dean Morgan is currently promoting The Walking Dead season 8. He appeared on Jimmy Kimmel Live to do so, having just wrapped up a night shoot on the hit AMC series, he seemed a bit groggy. Kimmel decided to ask him about the possibility of suiting up as the Thomas Wayne version of Batman in Flashpoint and, he absolutely didn't say he's going to and he didn't claim to know anything. But it's the way in which he responded that might have fans scratching their heads. He was dodging the question like a bullet. "I didn't say s***... No, I don't know anything. The DC has a lot going on." That's all he really said about it, but watching the video of his reaction after Jimmy Kimmel asks the question is telling. He's grinning from ear to ear. Laughing. Trying not to say anything. He probably doesn't want to inspire false hope if he truly doesn't know anything, especially since playing Batman in Flashpoint is a very real possibility, even if those conversations haven't happened just yet. This is a popular idea among fans and it fits into the comic book storyline. In case you aren't familiar with the Flashpoint storyline, it's considered one of the most important stories in the DC Comics universe. The story sees Barry Allen travel back in time to try and stop the murder of his mother. However, when he returns to the present, his mother is still alive but the world is a very different place. The Justice League doesn't exist and the world is in a state of chaos. Barry has to do everything he can to set things right. One consequence of this time travel business is that, instead of Thomas Wayne dying in that alley at the hands of a mugger, it's actually Bruce Wayne who dies. So, Batman's dad, played by Jeffrey Dean Morgan in Batman V. Superman: Dawn of Justice, takes up the mantle of Batman. Flashpoint doesn't have a release date yet, but the script for the movie is complete and Warner Bros. is looking to hire a director. The other possibility with this movie is that Lauren Cohan, who plays Martha Wayne in the DCEU, could possibly wind up playing The Joker in Flashpoint. But for now, people are focusing on Jeffrey Dean Morgan as Batman, which doesn't seem to be off the table. You can check out the video, courtesy of Jimmy Kimmel Live, for yourself below.